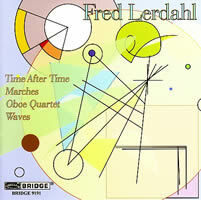 Fred LERDAHL: Time After Time* (2000); Marches** (1992); Oboe Quartet*** (2002); Waves† (1988). La Fenice***, Antares**, Columbia Sinfonietta*, Jeffrey Milarsky (cond. )*, Orpheus Chamber Orchestra†. Bridge Records 9191 (http://www.bridgerecords.com/). 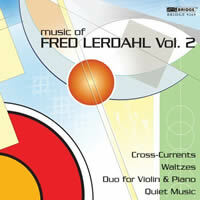 Fred LERDAHL: Cross-Currents (1987); Waltzes* (1981); Duo** (2005); Quiet Music (1994). Rolf Schulte (vln)* & **, Scott Nickrenz (vla)*, Fred Sherry (vc)*, Donald Palma (db)*, James Winn (pf)**, Odense Symphony Orchestra, Paul Mann (cond.). Bridge Records 9269 (http://www.bridgerecords.com/). Like his late Columbia colleague Jonathan D. Kramer, Fred Lerdahl is a respected writer as well as a frugal, but important, composer: His catalogue numbers fewer than 30 pieces. His showcase technique is “expanding variations,” not dissimilar to Jean Barraqué’s creation of new tone rows from one matrix, but as Lerdahl insists, one grounded more in tonality. Bridge has embarked on a Lerdahl series. The first disc begins with the two-movement sextet Time After Time, whose predominant feature is a pulse that disorients the ears: Are they hearing slow music played too quickly, or fast music played too slowly? The coda is too long, diminishing the experience rather than enhancing it. That piece is for “Pierrot-plus,” with a percussionist as the addition, whereas Marches is for “Pierrot-minus,” without a flutist. It, too, overstays its material near the close, but otherwise is surprisingly restrained or inward. The highlight is the immediate Oboe Quartet, a lush dialogue without any unwarranted ostentation from either oboe or strings. The thick and prodding recorded sound of Waves, reissued from DG, is an obstacle for winds and horns, already overpowered in number by strings. The piece itself, despite a fine frenzy toward the end, is too minimal to bear repeated listenings. Perhaps the fact that John Adams was its first conductor is a clue. The second disc is more rewarding overall, with Cross-Currents revealing an ease of writing; the other orchestral piece, the disc-closing Quiet Music, is a unique work in Lerdahl’s catalogue, its luminescent, gentle motifs uniting subdued sequences. Waltzes is another reissue, this time from CRI, and is the first Lerdahl work I remember hearing: I continue to appreciate its mercurial temperament and downright joy, only occasionally dampened by profundity. Duo is simultaneously dense and expansive, at almost 20 minutes, but also a fine display of various modes of interaction and overlapping. Brook Ellis’ colorful cover art seems somehow appropriate, because Lerdahl is a fine orchestrator. Performances, without the benefit of scores, would seem to be universally even. Both discs feature laudatory essays, one by Carl Voss and one by Paul Moravec, though the recording venue of SUNY Purchase is strangely misspelled twice. 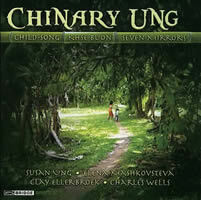 Chinary UNG: Khse Buon* (1980); Child Song** (1983); Seven Mirrors*** (1997). Clay Ellerbroek (a fl)**, Susan Ung (vla)* & **, Elena Mashkovtseva (hp)**, Charles Wells (pf)***. Bridge Records 9277 (http://www.bridgerecords.com/). Cambodian Chinary Ung is only a few months older than Lerdahl, but comes from a completely different tradition and not only in terms of geography. This disc features three lengthy explorations of sound of a freely rhapsodic nature. The composer’s wife Susan plays Khse Buon for string instrument with conviction and enough warmth to stave off ennui after some 17 minutes. Child Song comes from the Debussy / Takemitsu line in instrumentation only; with its wandering and extended moments in which the three players seem to be isolated, improvising on their own, Ung seems more interested in the possibilities of personality than in unmitigated contemplation or merry pastoral picture-painting. The piano series Seven Mirrors is less distinctive with its episodic nature, but gives a few impressive keyboard storms along the way. Laurie RADFORD: Everything We See in the Sky (2005). Alice PING-YEE HO: String Quartet No. 2 (2003). Piotr GRELLA-MOŻEJKO: The Secret Garden (Music for Agnieszka Holland) (String Quartet No. 2) (1999-2002). Daniel JANKE: String Quartet No. 1 (2005). Jeffrey RYAN: String Quartet No. 3, “sonata distorta” (2006). 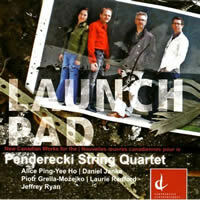 Penderecki String Quartet: Jeremy Bell, Jerzy Kaplanek (vlns), Christine Vlajk (vla), Simon Fryer (vc). Centrediscs CMCCD 13308 (http://www.musiccentre.ca/recordings/centrediscs). A disc of new string quartets by various composers is to be viewed with skepticism, the risk of overload never far away. I was familiar with only one item beforehand and this same piece remains the one to prove captivating afterward. The Penderecki String Quartet presents five recent pieces by their Canadian compatriots. Everything We See in the Sky is, like much of Radford’s music, for live performers with signal processing, yet the electronic element never rises above superfluity and no amount of technical wizardry will rescue a dry piece. Ho’s quartet is cast in two movements and resorts to the cliché of vocalization in the first, after which I was never able to regain any engagement. Grella-Możejko’s second quartet is less dramatic and intense than the first, recorded on Eclectra ECCD-2050, but compensates with a slow-fast-slow scheme in which the fast is a lengthy moment of exposure for the quartet: Rhythms are indicated, but not pitches. The PSQ seems rather reluctant to react to the composer’s invitation to be lively and wild here, opting for a more modest and more conventional reading. The quartet also seems rather timid to such score indications as schiacciante or agitato ma delicatissimo, perhaps keeping the work grounded instead of allowing it to soar. The concluding morendo al fine… I found too slow, bordering on the bathetic. Janke’s ten-minute quartet is tightly argued, but without much argument; the piece seems designed to engender antipathy, or is the performance again at fault? Ryan’s Third Quartet has Beethoven quotations and is inspired by Tolstoy’s The Kreutzer Sonata, which was in turn inspired by Beethoven, but wisely shuns them for much of its duration. The principal problem is that the distortion of its subtitle borders on the ghastly, needlessly surpassing reason and going from effect to nuisance. A work with less superficial gauze may well have left a greater impression. My reservations aside, I am grateful that PSQ has made such a presentation and continues to champion so much new music, against all odds. Much of it deserves only a single outing, but one never knows what to expect or which pieces will find a brighter future. Piotr GRELLA-MOŻEJKO: …river to the ocean… (1996). Jean LESAGE: Le livre des mélancolies (1999). Tim BRADY: Slow Dances (1999). Jean-Guy Boisvert (cl), Quatuor Bozzini: Clemens Merkel, Nadia Francavilla (vlns), Stéphanie Bozzini (vla), Isabelle Bozzini (vc). Atma Classique ACD2 2552 (http://www.atmaclassique.com/). Distributed in the US by Naxos (http://www.naxos.com/). Now a disc of clarinet quintets and the Polish-born Grella-Możejko makes an appearance here too, with the impressive …river to the ocean… leading off. The piece is a monologue of sorts, with the strings unobtrusive except for a few instances, but the work would lack a core without their haunting presence. The engineers have succeeded quite well in adequately transferring an environment in which the sounds range from ppppp to fffff to the home. Lesage’s piece gives the recording its title, but finds no particular aim in any of its three movements; the piece is excessively brooding and rather blunted in its progress, preferring a monotonous timbral palette. I am sure that even melancholy has more than one hue. Brady’s work seems even worse, alas: The dances in question are Triple Dance, A Sort of Tango, Solo – Sixes and Sevens and Interrupted Procession, yet Brady provides no great rhythmic allure, fine melodies, varied harmonies, or other salient features to recommend them. 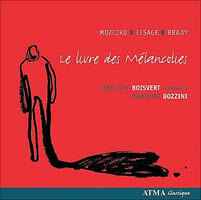 The musicians seem committed, though the Bozzini has fared better on earlier outings, and Boisvert in particular deserves praise for espousing composers of such different stylistic methods with such professionalism, sometimes more than the music would seem to deserve.